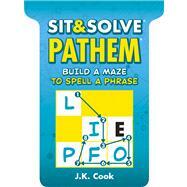 Introducing a clever, addictive new logic puzzle from inventor J.K. Cook! Easy to learn, fun and challenging, it involves making words Boggle-style by putting letters into a grid in the correct places. You can move in any direction as you solve, place the letters one by one, and even reuse them.